48 Hour Dream Trip to Ashtabula - Ohio. Find It Here. Ashtabula County has long been known as an affordable lakeside destination with its 26 miles of Lake Erie shoreline. Find everything you need for the perfect getaway, from rolling vineyards, fresh seafood plates and charming small businesses to picturesque covered bridges and cozy cabins. Click here for a chance to win a trip to Ashtabula! Read on for more inspiration. Drive through acres of the Grand River Valley, where you’ll find the vineyards are endless. 70% of Ohio’s grapes are grown here, as twenty-four wineries dot the countryside serving the nectar of the Gods. 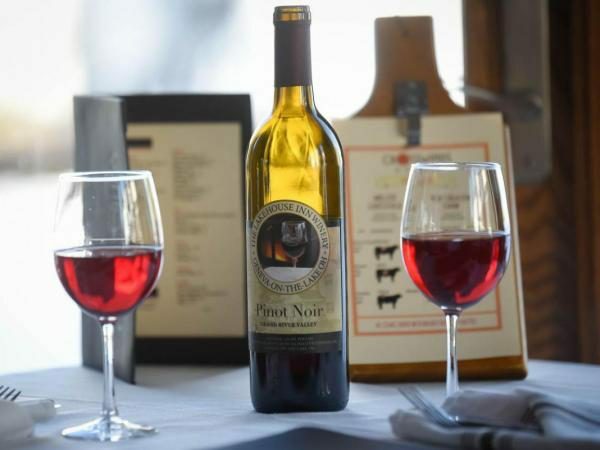 Sip and sample your way through the wine region and ask for the estate wines – grapes used to produce these wines were grown onsite with particular care and offer outstanding flavor. Looking for a great red wine? Try the Meritage Reserve at M Cellars. A dessert wine fan? Give Laurello’s Habanero Ice Wine a try! If you’re searching to sip with a view, sights from South River’s patio can’t be missed – and if the weather isn’t cooperating, Laurentia’s magnificent interior is sure to take your breath away. Click here for a chance to win this dream trip to Ashtabula. A Playground for Your Taste Buds. Not long after sunrise or just before sunset… this is the best time of day to walk along the shores of Lake Erie. Feel the sand between your toes as light shines just right to catch a sparkle among small pebbles. You’ll find small pieces of polished beach glass, unique upcycled gems from the deep. Or, enjoy it all from the comfort of your own car – Conneaut Township Park is one of the few places in the US where guests can drive onto the beach. 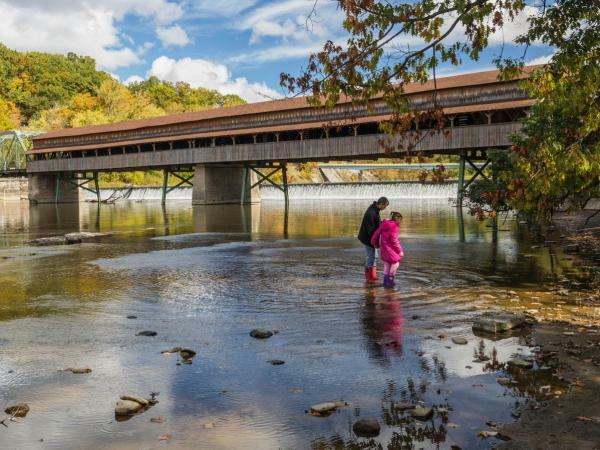 Ashtabula County is home to 19 covered bridges, including the longest covered bridge in the United States, the Smolen-Gulf Covered Bridge. Most of the bridges are still in use today – connecting a piece of the past to the present. 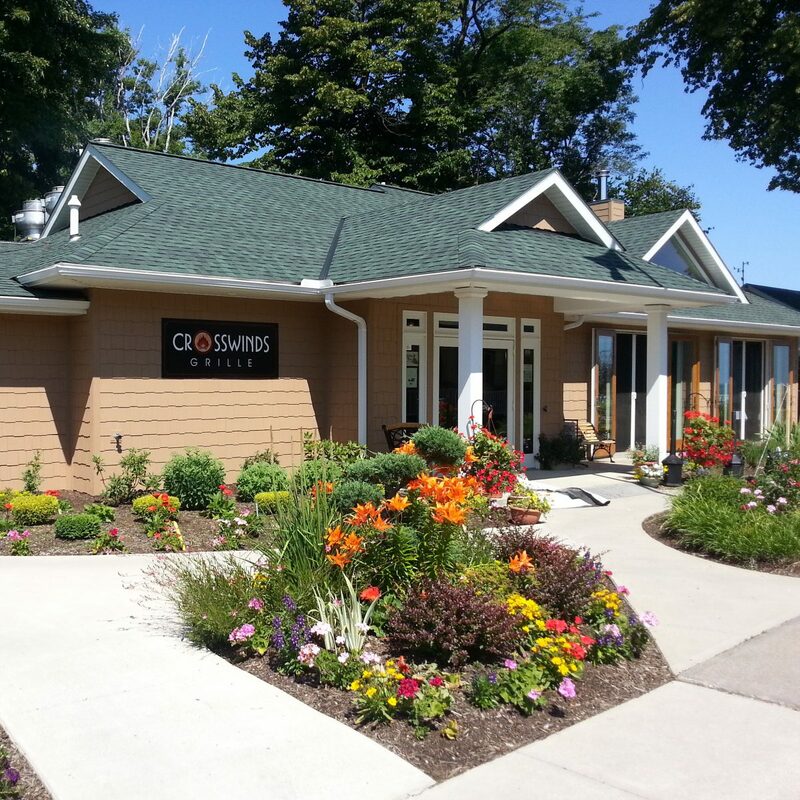 There’s nothing quite like the lakeside dining offered at Crosswinds Grille at Geneva-on-the-Lake. A crowning jewel of the Lakehouse Inn property (also featuring a spa and winery), it offers a locally-sourced menu that changes each season. Cap off your meal with a special request recipe from Chef Nate that combines warm Bourbon Barrell Maple Syrup, homemade ice cream and Seven Brothers wheat whiskey. Be sure to ask your server why this dessert is called the Heavenly Kathy Jo! 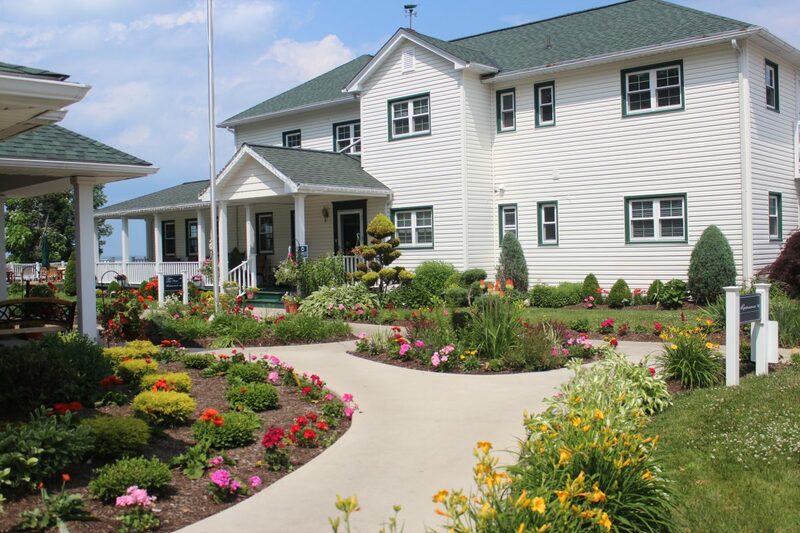 Nestled along the southern shore of Lake Erie, you’ll find The Lakehouse Inn. Enjoy comfortable lodging, a spa, full-production winery and a farm-to-table restaurant, all in one location. 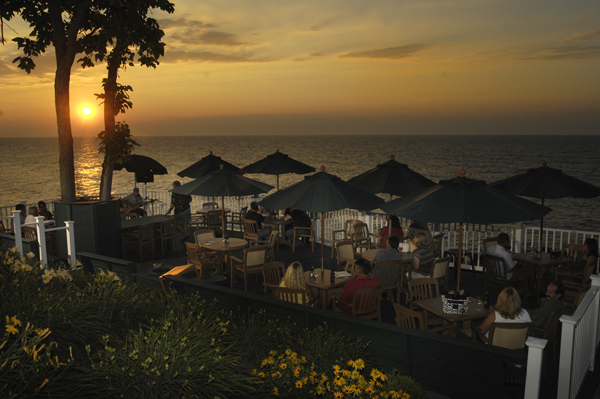 Get a slice of luxury by basking in a beautiful Lake Erie sunset or treating yourself to a gourmet meal. 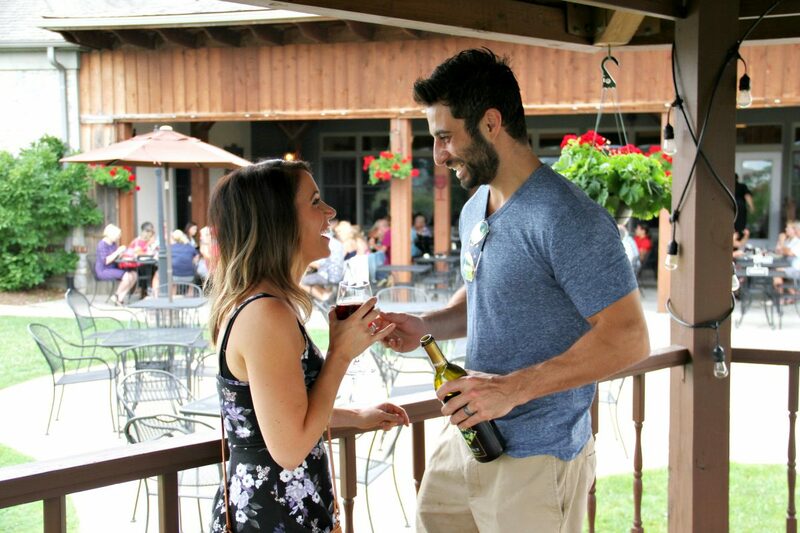 Or, the cabins at Vineyard Woods are just what you are looking for: clean, modern, luxurious, minutes from the highway and a short walk to the nearest winery. Wind down after a busy day beside the fire then sleep in cozy comfort. Win a $5000 package which can be used for your Ashtabula Dream Trip. NO PURCHASE NECESSARY. Open to legal residents of the 50 United States and D.C., 21 years and older. Begins: 12:01 a.m. ET on 1/4/19 and ends at 11:59 p.m. ET on 2/21/19. Subject to Official Rules available at www.midwestliving.com/dreamtrip. Void where prohibited. Sponsor: Meredith Corporation.